Are you thinking of picking up a new hobby? Maybe mountain biking? Then you’ll need a suitable bike. Or maybe you’re just looking for a replacement for your old mountain bike. Nevertheless, you’ve come to the right place. As you already might know biking is an expensive hobby. A new mountain bike with all the new extras might cost more than you can afford. You shouldn’t despair. 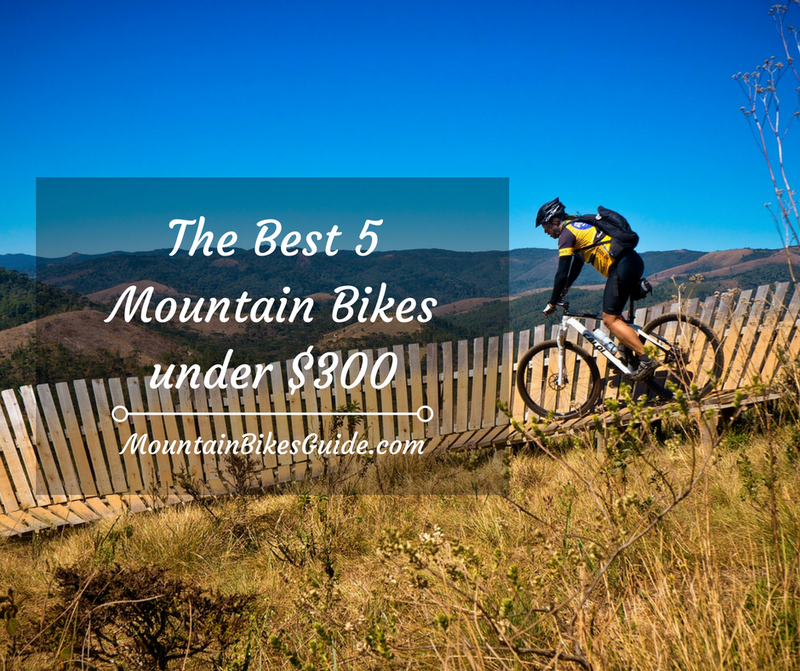 You’ll be surprised how many mountain bikes under 300 $ you can find. Many manufacturers know that people on tight budgets want a durable bike and they are offering quality bikes with enough features to make them worth a look. Here, I’ve made up a list of the best mountain bikes under 300$, which would suit the needs of every average biker. 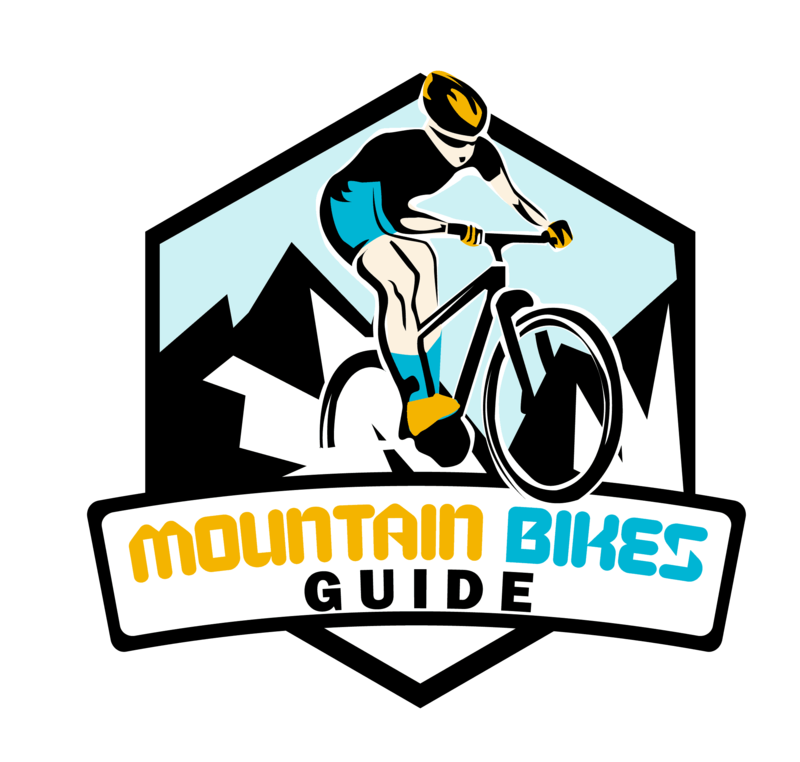 Before we take a detailed look at my top 5 picks, let’s talk about the most important thing – what to look for when we are choosing a mountain bike. If you are a novice in the biking world, all bikes probably look the same for you. But there are some important things that you should take into consideration when you pick your first bike. Trail bikes. These bikes are efficient, not very heavy, and versatile. If you need a bike for the occasional trail ride, then this is your bike. Cross-country bike. If you are looking for a bike that will help you to outrace your friends, then you need a cross-country bike. They are usually light, with large wheels and they are designed for maximum pedal strokes. Such a bike is ideal for long distance riding. All-mountain bikes. These bikes are suitable if you want to ride in unexplored terrains because they can handle ascents and descents. Fat bikes. Choose a fat bike if you want to ride all year r​​ound – in snow, dirt, ice or even sand. They have oversized tires that provide better traction. Such bikes are an excellent choice for a beginner. Enduro bikes. Suitable for fast descents, challenging terrains, and enduro racing. Rigid bikes don’t have any kind of suspension. The major disadvantage is that you’ll feel every bump on the road with these bikes. But one advantage is that these bikes are very light, easy to ride and low-cost to maintain. However, they aren’t very common nowadays. Hardtail bikes feature suspension in the front fork and no suspension in the rear. That’s why they are called hardtails. What’s good about this type of suspension is that your upper limbs won’t get so tired if you ride for a long time. A front suspension also makes steering the bike or sustaining a high-speed easier. In general, bikes with full suspension are heavier than bikes with front suspension. They also tend to be more expensive than front suspension ones. However, they are more comfortable since the front and the rear suspensions absorb the shocks and cushion the rider. They are perfect for going down a bumpy hill. 27.5” wheels provide better maneuvering power than 29” wheels, and they roll more smoothly than 26” wheels. But the 29” wheels offer better traction and more efficiency. The 27.5” are suitable for short people, while they 29” and the best fit for a tall person. When choosing a wheel size, just keep in mind where are you going to ride your bike and what you need – efficiency or versatility. When it comes to bikes, maybe the most important thing is the brakes. After all, no one wants to find himself face down on the ground. The choice is between disc or rim brakes. If you want reliable brakes with a superior braking power, look for disc brakes. They cost more, and they add weight to the bike, but they don’t require you to apply much finger effort on the levers in case you need to stop immediately. Rim brakes, on the other hand, are less expensive, but they are of no help on a muddy road, and they wear the wheel rim with time. Their advantage is that it’s to check them for brake pad wear than disc brakes. Now, let’s take a look at our top picks and discuss what makes them such a suitable choice for you. 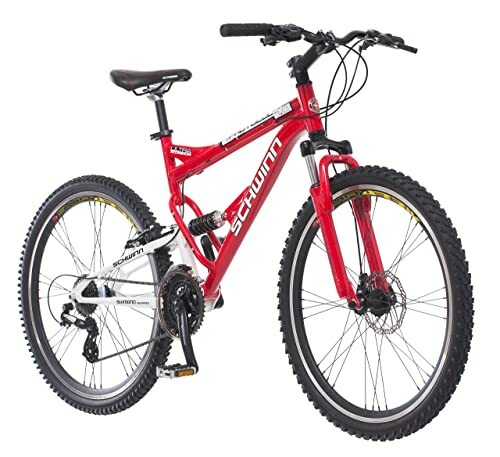 Schwinn is one of the most respectable and trusted brands when it comes to mountain bikes. So, it’s worth sparing a moment a look at the Schwinn Protocol 1.0 men’s mountain bike which features an aluminum dual-suspension frame. It’s painted in beautiful red and black colors which make it a stylish choice for any man. It’s relatively light, and the dual-suspension system provides an excellent traction so that the bike is easier to control. In addition to this, due to the front suspension fork, your arms and shoulder won’t be aching after a long day riding. 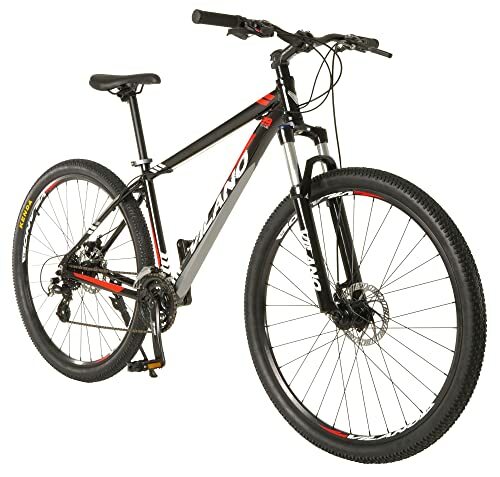 This mountain bikes also has 24-speed Shimano EZ- fire trigger shifters coupled with a Shimano rear derailleur. That’s awesome because you have a wide gear range at your disposal for all kinds of terrains and you can shift quickly and smoothly between gears. Moreover, this bike has a front disk brake and a rear alloy V-brake. That would be extremely useful in case you have to stop suddenly due to an obstacle on the road. On the other hand, the high-quality knobby 26” wheels supported by light and strong alloy rims guarantee a smooth ride. 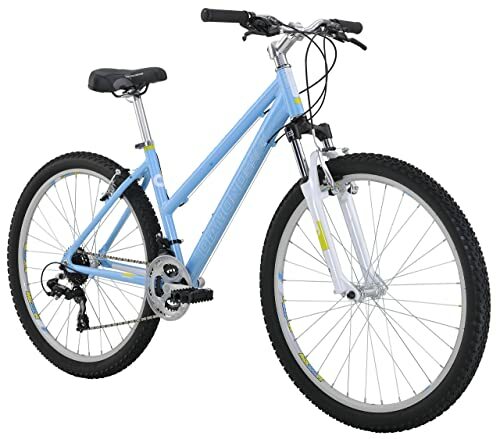 This stylish blue and black mountain bike offered to us by Diamondback is an excellent choice for any woman that wants an affordable mountain bike. The Laurito Hardtail mountain bike features a heat-treated aluminum frame for extra durability, and it comes to you partially assembled. It’s also relatively light so you can carry it over obstacles on your course without breaking a sweat. The Diamondback bike also has 21 speeds in addition to Shimano 7-speed rear derailleur and three chain rings, which is great because you can adjust the speed of the bike quickly according to the terrain. What’s more, due to the Tektro Alloy linear pull brakes, you don’t have to worry about stopping when you need to do it fast. In addition to all these amazing features, this mountain bike has 27.5” wheels which make it perfect if you need smooth rolling wheels for rugged terrains. On the other hand, the Trail XC suspension fork is great for absorbing bumps, so you’ll also have a comfortable ride no matter whether there are cracks or debris on the road. Another thing that sets this bike apart from other models is that the frame has eyelets so that you can mount fenders and a rack. If you are looking for a bike that you can ride both on a smooth pavement or a rugged trail, you might consider the Vilano Blackjack mountain bike. It has a handcrafted 606l ammonium frame that provides both durability and lightness, while the front suspension fork with lockout option makes sure that any bumps or holes that you encounter on the road are a no bother to you. Another amazing thing about this mountain bike is that it has front and rear mechanical disc brakes that ensure that you’ll always stop on time. You’ll especially appreciate these brakes if you ever find yourself riding on a wet and musky road. The wheels of the Vilano Blackjack mountain bike measure 29” which is great because they roll smoothly in a straight line and even large holes are not an obstacle for them. These wheels make the Vilano bike especially suitable if you need a bike for cross country riding. If that’s not enough to convince you of the quality of the Vilano Blackjack bike, here’s more. It has 24 speeds for those of you that want more speed options on a tight budget. Moreover, it features Shimano 8 speed EF-51 integrated shifter/ brake lever so that you can shift the gears smoothly and effortlessly. 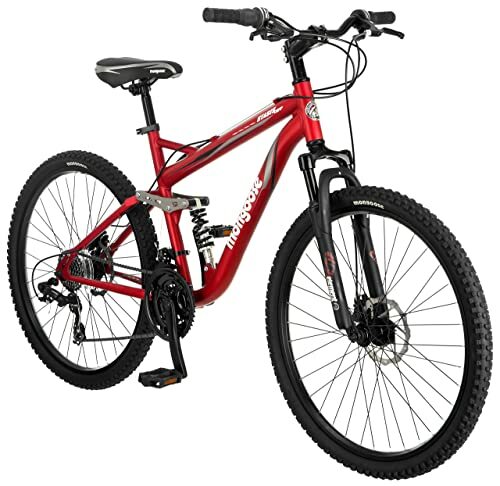 The Mongoose mountain bike brand is well-known and trusted one, and they have just the thing for you – this Stasis Comp mountain bicycle painted in an elegant red color. It has a strong and durable 18-inch aluminum full-suspension frame, which makes it an excellent choice for anyone that needs an agile bike. The front suspension fork will make your ride a pleasant and comfortable experience, even when you’re on a tough terrain. On the other hand, the 21 speeds and the SRAM twist shifter coupled with Shimano rear derailleur give you plenty of speed and control over the bike even when you’re climbing uphill. These are not the only awesome features of this full suspension mountain bike. It’s equipped with front and rear disc brakes so that it provides security and sufficient braking power when you’re going downhill at full speed. While the 26” wheels might seem small at the beginning, but you’ll appreciate their size when you have to do a quick maneuver. What’s more, this bike has alloy rims in combination with a 3-piece alloy crank for extra durability. One more thing that sets this bike aside is the alloy wheel rims with quick release front so that you can store the bike easily or fit it in the trunk of your car. 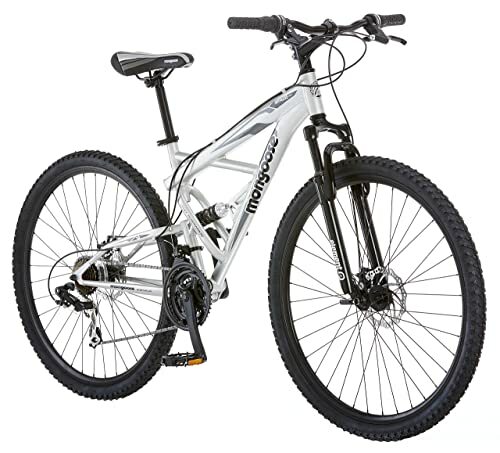 Another representative of the Mongoose brand, this dual full-suspension bicycle will fulfill the needs of every biker. It features a sturdy aluminum suspension frame for high-performance and conformability in addition to an element suspension fork for improved control over the bike. Another excellent feature of the Mongoose bike is the 29” wheels which will help you ride through any jagged paths in no time. If that’s not enough the quick-release front means that you can remove the wheel quickly and without any tools. This makes the bike a perfect choice if you have a limited storage space or you just want to transport it in your car. Moreover, this bike has 21 speeds, a Shimano rear derailleur, and SRAM twist shifters which you would appreciate if you have to change gears quickly. Also, if you need to stop immediately, the alloy front and rear disc brake won’t disappoint you. With such brakes, you won’t have any issues even on wet roads. As we already said, 29” wheels provide better traction than smaller ones. But the dealbreaker is that you’ll cross most of the obstacles on your path without ending up on the ground. The 24 speeds and the mechanic disc brakes, on the other hand, mean that you have more speed options and sufficient braking power at the same time. Moreover, since this is a front suspension bike, it will not require so much maintenance as a full-suspension one. You see that you can find some real bargains when it comes to mountain bikes. So think carefully what you want and make your final selection. And remember that whichever bike you choose it’ll still need regular maintenance to keep it in top shape.